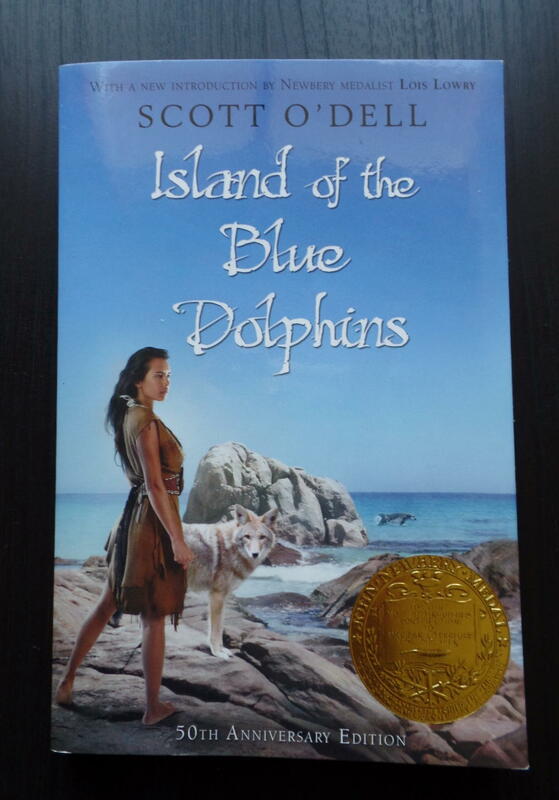 Reading Island of the Blue Dolphins for the First Time – The Bookshelf of Emily J.
I’ve just read Island of the Blue Dolphins (1960) by Scott O’Dell for the first time. What a delightful, wonderful book. I’m somewhat disappointed that I didn’t have the experience of reading it as a child, but I got to read it with my daughter, and it was fun. She started reading it on her own, as the book was a gift from one of her aunties. However, after the first few chapters, she brought it to me and explained that it was a little bit scary. Karana’s brother dies in the first few chapters, and she finds herself alone on the island, so my daughter wasn’t quite sure she wanted to continue reading it on her own. I was more than happy to read it to her, and we started over from the beginning. The book is an account of Karana’s life on the island. She lives there with her tribe, which is attacked by Aleut hunters who traveled there for otter hunting. The tribal leader asks for half of the pelts hunted, but the Aleuts try to leave without paying up, and a battle ensues. This leaves the tribe somewhat devastated, and a new leader ends up taking a canoe off to another land to find help. He never returns, but later a ship of white men come and pick up the whole tribe. However, Karana realizes that her younger brother has not made it onto the ship as it is leaving, so she jumps from it and swims to shore to be with him. The two live together, trying to survive on the island, and then Karana finds herself alone after her brother dies from wild dogs attacking him. He was too young to go out alone, but he had left while Karana was sleeping in order to prove himself. The rest of the novel traces Karana’s attempts to survive, and her resourcefulness. My favorite parts involved her learning to make tools and a canoe, for she was told by the men of her tribe that only men could make such tools and that if a woman did it she would die. Karana doesn’t die. She uses those tools to her advantage, and she even makes a large spear for hunting what she calls the “devilfish.” In a particularly exciting episode, she spears one (it is a large squid), but in the fight to keep it on the beach, its tentacles attack her and her dog, and they ultimately lose it and never attempt to spear one again. A heartwarming aspect of this survival book is Karana’s dog, Rontu. He is the leader of the pack of wild dogs, but Karana decides to attack them after they kill her brother. She wounds Rontu in her attack, but ultimately takes pity and nurses him back to health. He stays with her and they become companions. Karana also learns to love other animals, and vows toward the end of her adventure not to harm another otter, sea elephant, or wild dog. She comes to appreciate animals and the companionship they give her over the years she spends on the island. Yes, she spends years there. Eventually, a ship comes and she goes with the men on the ship. She is taken to the Santa Barbara Mission in California, where a priest learns her story. This end to the novel comes from the real life story. Yes, this was a true story. A woman really lived on that island alone for many years, her brother really died there, and the ship that carried her tribe never returned because it had sunk. If she hadn’t jumped from it, she would’ve died too. I was shocked to learn that this Newbery Medal book was based on a true story, and it made my engagement with the narrative seem more real and more worthwhile in some ways. This book is a must-read in terms of young adult literature, especially when it comes to books about survival. I think these types of books appeal to young people because of the autonomy and freedom such novels represent. They are a different type of fantasy book, one that seems real and within reach, if scary and somewhat uncertain. I think most children have dreamed of being on their own or wondered just how savvy and sophisticated they could be surviving off of the land without parents or technology. This book gives us a taste of that, and I loved every minute of it. Every time somebody came to my house and saw the book on the side table, waiting for its evening reading with me and my daughter, they would comment on how much they had enjoyed that book as a child. I suspect that if you haven’t yet read this one, you’ll enjoy it too. I also missed this one when I was the right age, although I remember lots of kids reading it. I haven’t read it yet, and I should sometime. I think you should. I can’t imagine anybody not liking this one. I hope they eventually do! I think they would like nothing they gave it a chance. Holy crap, I loved that book as a kid! This was my favorite as a child for many years. I didn’t know it was a true story until I looked it up as an adult. I am happy to say I found an old copy that looks like it was well loved. I remember reading Island of the Blue Dolphins when I was about 9 and wanting to inhabit the island with the characters. It’s a classic! I’m so glad you discovered this book, albeit as an adult. I never read Little Women as a child, but I enjoyed it so much when I finally did read it as an adult, so I understand that feeling of excitement blended with wistfulness. It is a fun feeling to discover such a great book, no matter what age. I read Little Women as a kid, and again as an adult, and I enjoyed it more as an adult! I haven’t read this either. I’ll definitely add it to my list. Sounds like a fun read and I already know I pretty much love every Newberry Medal winner I’ve ever read. I think you would particularly love this one! Let me know what you think. I loved this book as a kid but I remember that it was pretty scary! My mom signed me up for a book of the month club and this was one of the books they sent me (I’m pretty sure I still have it). It is quite scary for a kid, but not in a horror type of way. I can see why this was part of the club. I can’t remember if I’ve read this, how does that happen? Lol. Back on the TBR list! I remember hearing about the book in elementary school and I might have read it then but I’m sure it is good enough to warrant a re-read! I am sure a reread would be worth it. I’m starting to think I need to reread most of the great books from my childhood. Thanks for sharing your experience. I am glad you and your daughter completed as the tales of life and death struggles are powerful. It was really fun to read it together! Scott O’Dell is, in general, an amazing author of historical fiction–especially the ones that are biographical fiction or otherwise based on a true story. Even if they can be somewhat frightening, even gruesome at times. Still, well worth reading. If you liked Island of the Blue Dolphins, I would definitely recommend checking out some of his other books as well. Thanks for the fun review! Thanks for reading! I have wanted to read more of his work since this one, so thanks for the encouragement. This book sounds great – I’m going to look out for it next time I’m on Amazon! I can totally see why this would be an all-time favorite for many kids. It is seriously a great book! I loved this book too. I urged my daughter to read it many times and she was resistant, but when she finally read it she hardly came up for air! Great review, makes me want to re-read it too! It is so funny how kids resist our recommendations and then realize how right we were! My daughter did that with Harry Potter and now we never see her! This time, I had issues with the appropriation of voice. The story is only loosely based on a real woman from the Nicoleño tribe. The author took many liberties that just seemed wrong to me. Make no mistake: most of these events are fictionalized. In my short article, I added a great link to a lecture about the famous Nicoleño woman that lived alone on that island. If you ever have an hour to spare, it’s well worth the time. Definitely a fictional version, as we don’t really know what she did every day and thought for all those years. I still think it’s worthy of the read, even if loosely based on history. It reminded me of a children’s version of Angle of Repose, which Stegner was criticized for in similar ways, but the novel is a masterpiece. I need to look into the two you mentioned. Those would make fun future reads with my daughter. I read this book a million times when I was younger. It’s one of the “most loved” books on my shelves. I had NO IDEA it was based on a true story… now I’m looking back at the book with new eyes. Thanks for sharing. Yeah, my whole conception of the story changed when I read the afterword about how it was based on a real person. So cool! This was one of my sons’ favorites. I need to revisit it! That and Hatchet by Gary Paulson. I had totally forgotten this was based upon a true story. Thanks for the reminder! Hatchet is such a fun book too! We recently read another like these, about survival, called My Side of the Mountain. I will post about it soon. I havent read this. Must get myself a copy.. Thanks.. Loved this book as a child. Pretty sure I am the only one of my siblings who read it for school but I absolutely adored it! Enjoyed reading what you had to say about the book, was a good refresher on what happened in it. I also just read this for the first time and was happily pleased with the experience. Should have read it much, much, earlier. Agreed! I wish I had experienced it as a child. Pingback: Testing Boundaries on My Side of the Mountain | The Bookshelf of Emily J.